The beginning stages. Prototype molds are manufactured for a specific reason, product development and approval. Since providing quality packaging is our only option, we must all be in full agreement with the initial design. Therefore, we feel that a confident final approval can only be given from your review and testing of a physical part. 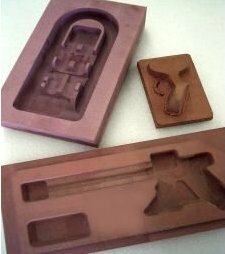 Prototype molds can be made from several different types of materials. The material used is dependant on your specific needs. By taking this crucial step in the initial product design, quality production parts are always guaranteed. Our fully automated sampling center enables us to provide you with near production quality sample blisters. It has a large 30" x 30" sampling area which allows testing of your initial prototypes or even complete form tooling. Sampling is an important part of the approval process. It provides accurate testing of product fit and gives you a true visual unlike any drawing. The advantage with such sophisticated equipment is that you can rest assured that you will receive the highest quality tooling and thermoformed blisters, that function as intended, before they even arrive at your door.